A year ago today. My brain felt like it was on fire from the medication they gave me. Writing about my experience with chronic illness is difficult; I feel as though I'm baring my soul in a way I never have before, even after 8 years of blogging, and basically being open to writing about anything. I am sitting here with one thought running through my mind, "I don't know how to do this." But that is how I've felt about this whole chronic illness business. 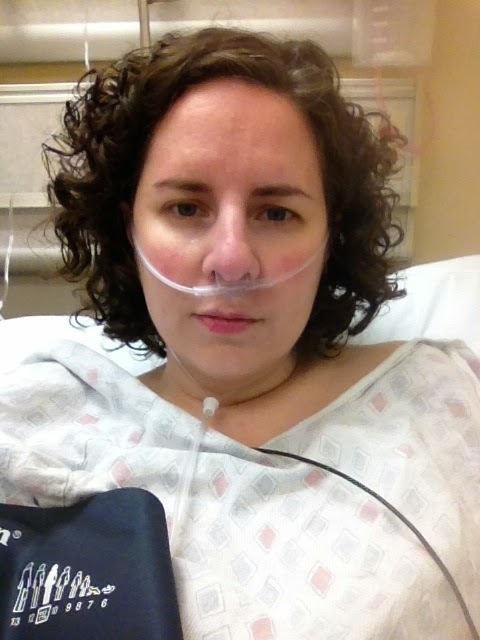 I don't know how to live with chronic illness. I lost my drive to do anything, even knitting and reading. I certainly didn't feel like leaving the house. The majority of my contact with the outside world was through my computer. It is hard for me to make plans when I know that canceling them is not just a possibility, but a probability. Hardest for me is that my relationship with my children has suffered. There have been entire months when I barely left my bed, and some of my children felt no desire to join me in my room to spend time with me. I feel like a burden to my family, them having to take care of me instead of me taking care of them. For the last 8 months, my most prominent symptom has been extreme fatigue. I stopped exercising completely because exercising used two days worth of energy. One thirty minute walk would put me in bed for at least 48 hours afterward. Grocery shopping was impossible. Gary took over all the cooking and grocery shopping. Occasionally, I would go grocery shopping with Gary, following him around the grocery store like a lost puppy. When Gary went out of town, we ordered delivery, or he tried to buy enough groceries to last us the time he was gone. Gary was out of town most of this February, and there was some discussion about me using a motorized wheelchair cart so that I could go grocery shopping. I forgot this idea when I went to the grocery store. Xavier pushed the grocery cart and did much of the actual shopping. We have to go to three different grocery stores to find the products we need because of food allergies. That day, Xavier did all the shopping at the second store, while I sat at the front of the store. We skipped the third. Just driving to and from the grocery store, along with walking around the grocery store was fatiguing enough that I didn't know if I would be able to drive home. It was very scary. When I first experienced symptoms, the most prominent one was speech problems. I would forget to finish a sentence, just stop talking in the middle of the sentence and have no idea what I was talking about. I began to slur my speech and stutter. It was incredibly difficult to get my thoughts from my mind to my mouth. It felt as though I had absolutely no control over my brain or body. Shortly after I started experiencing speech problems, we had a social function to attend. Gary sat me next to a 'safe' friend. We had been friends for a few years, and she immediately started talking. Talking was what we both did best; well, it was what we both used to do best. I know longer did anything well except sleep. When I started trying to talk, she looked at me in horror. Within moments, my 'safe' friend had moved to another table, and I was left to sit alone. That experience has exemplified what chronic illness means to me. I have lost friends, and family has become distant. It feels as though I have spent the last five years watching the world walk away. Thank you, Jenny. I haven't shared much of my struggles, which I think makes it harder for my friends to know what I'm going through. I interviewed the rest of my family, and plan to post those interviews over the next few weeks. I hope you'll enjoy them. I'm very sorry that you're dealing with so much. I had no idea that you are living with chronic physical issues. I, too, have had chronic illness for about 25 yrs. I look forward to seeing the next posting. I really hate that you have struggled so much. Love to you. I'm really mad at that "friend" right now. What a beautiful post! I am so sad to hear about what having this illness has done to almost every aspect of your life! That has to be a challenge. What positive things have come from having a chronic illness? Cindy, I'm not mad at her anymore. I have, over the last several years, come to realize she is very shallow. That's just how she is. She's a good person to chat with, but not count on. Thank you, though. Thank you, Cindy K. I know about your struggle with illness, for as long as I can remember, but I don't know much about it. I've wondered about genetics, since I know that Grandmother had some pretty severe allergies at one time, around the time Sally was born. Paige, Thank you for your kind words. I can honestly say that I believe that nothing good has come from this illness that I could not have gotten from not having it. Perhaps the only good thing about it would be that I understand what others with chronic illness go through. I would prefer that those people not have to deal with chronic illness, instead of needing understanding for it. Candy, thank you so much. As I told Jessica, I've thought of you often over the last 5 years. I worry about you. I did have a patient come in the other day and tell me how to fix all my problems. I wish that what she had told me was new information. I know it is from a kind place. I feel truly thankful that I have such an amazing husband, and my children are wonderful. They never complain about taking care of me, and I am always thankful for that. Jenny C, thank you. I wonder about you as well, and I noticed that you have a new young one. She's adorable, of course. Hope I can make it out sometime to see her. Thank you for stopping by. Hmmmn, that came out oddly now that i look at it. I was trying to say that your friendship has been a gift to me. And that your difficult journey is helping me to deal with mine - I was too exhausted to even begin to look for solutions and you had already walked that path and knew the right doctor to talk to. I wish exhaustion was all you had to deal with. It is bad enough and the rest has seemed much scarier.